Once a workflow is active, you can monitor actions as they occur. Learn how to monitor the performance of your workflows. Review emails sent and activities created by all workflows or view details on a specific record. The Overview section of Automated Workflows displays information from all of your workflows. Results are shown in graphs and lists so you can watch the pulse of your automated workflows.The overview area contains a timeline of all actions, bounce & spam in the last 30 days, and a list of actions triggered. With this graph, you'll see the number of emails sent and activities assigned across all workflows. 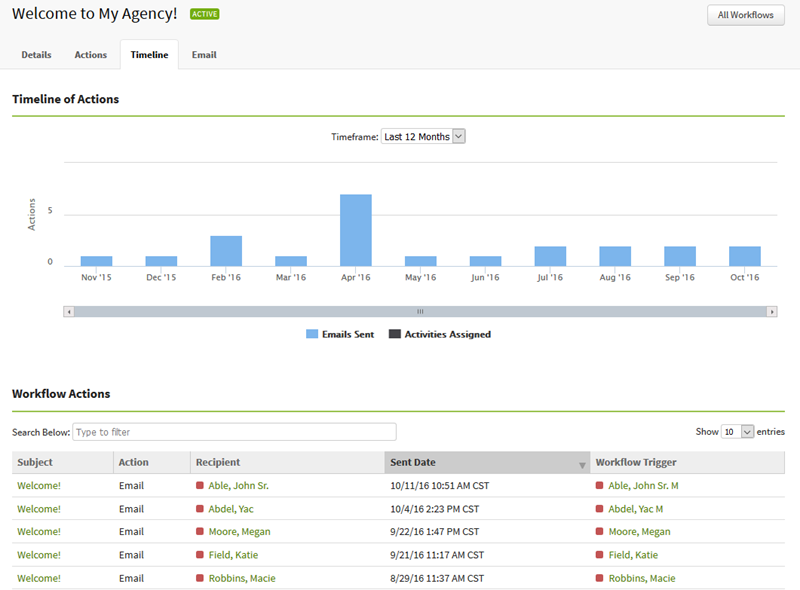 Much like other graphs within AgencyBloc, you can roll over the bars to view details. Adjust the timeframe filter at the top of the graph to switch the between the last 12 months or the last 30 days. For a more granular look, view a list of emails sent and activities created by all of your workflows. The actions triggered area lists the type of action, to recipient or assignee, the date, and which workflow created the action. By default, the list is sorted by sent date, with the most recent at the top of the list. You can sort the list by clicking on the header of a column. You can also search for or filter actions. For example, When you want to see all the emails sent, filter by the term ‘Email’. Or, if you wanted to see all actions for a particular individual, filter by the individual’s name. When you want to look into details further, simply select a link and you will be directed to that area or record. To view a copy of the email sent, simply click on the subject of an email. There may be times you'll want to review how a particular workflow is performing. 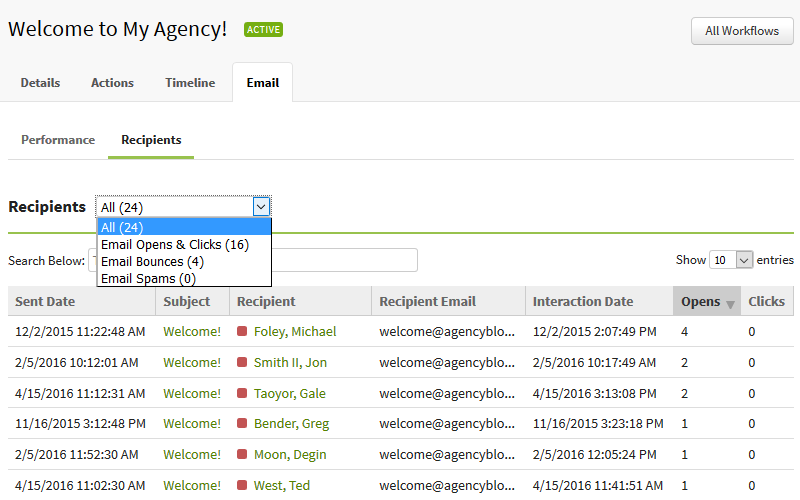 Across AgencyBloc, selecting a workflow’s name will take you to that detail tab for that workflow. Once viewing a workflow, you can then select to view a workflow’s timeline or email performance. Please note, for workflows with just activity actions, you'll only see the timeline tab. By clicking on the workflow’s Timeline tab, you will be able to see the history of all of the actions under the workflow. At a glance, you can see which months have had the most activity, and which actions have been sent recently. With this graph, you'll see the number of emails sent and activities assigned from the last 12 months or the 30 days. Much like other graphs within AgencyBloc, you can roll over the bars in the graph to see more details. View emails sent and activities created across by the workflow. The actions triggered list displays the type of action, to recipient or assignee, the date, and which workflow created the action. By default, the list is sorted by Sent Date, with the most recent at the top of the list. You can sort the list by clicking on the header of a column. You can also search for or filter actions. If you wanted to see all of the actions taken for a particular individual, you can filter by the individual’s name. When you want to look into details further, simply follow the links displayed. within each entry that will show you more detail or direct you important detail pages. If your workflow is sending emails, you can check on the performance of each email by using the email tab. The Email Performance list shows each email action in your workflow, the number of times the email action has been sent, % opened, % clicked, and timing from the trigger. Use this information to determine if your email is being well received (% opened) and if recipients are clicking on your links (% clicked). The Most Popular Links list shows you each link you included in your email actions and the number of times recipients have clicked on the link. Use this to inform decisions on whether you should update the content of your emails or move your links in the body of the email. 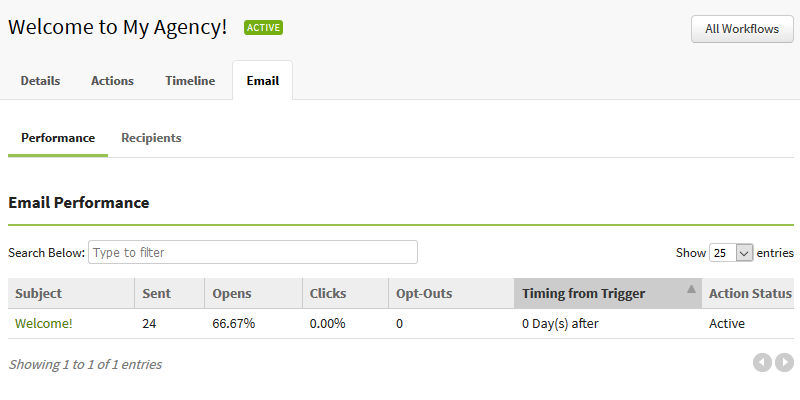 By default, the Email Performance list is sorted by Timing from Trigger, with the near term at the top of the list. You can sort the lists by clicking on the header of a column. Email Opens & Clicks - A combination or recipients who opened the email and if applicable, clicked a link in the email content. Email Spam - recipients who reported the email as spam. By default, the list sorted by opens, with the highest number at the top of the list. You can sort the lists by clicking on the header of a column. For example, you can click on the ‘Recipient’ header to sort the list by recipient.